oh it's so lovely....pretty & feminine. 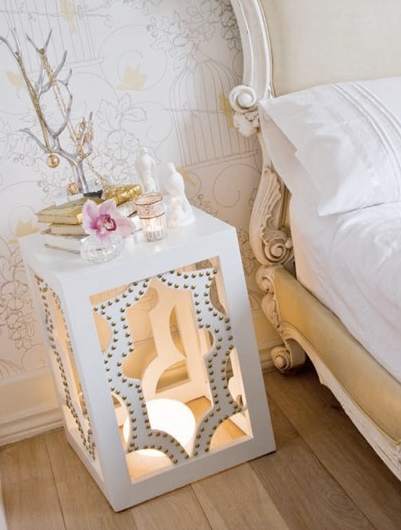 Love the bed side table!! Oh love the side table..
oh my! that first picture is breathtaking!!! Love it all. And the wallpaper! ah, i love this room! i think it might make getting out of bed even harder, though. 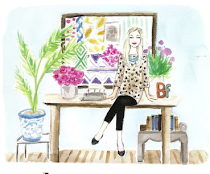 Fabulous theme for a post! I love the second image. I'd love to have that night stand... it looks incredible. That first picture has the best 'office space' with that table and awesome chair! I'm dying over that second night stand. Do you know who it's by? I can't find it on Canadian House and Home. Thanks. Wow, I love that first table! I think that will be added to my scouting list as I would love it next to a chair I have in the LR! Fabulous post! *GASP* Does anyone happen to know who made the wallpaper in picture 2?! It reminds me of a modern toile. I love toile! I appreciate your post . Like this a lot .